Network traffic analysis is one of the core functions in network monitoring for effective network operations and management. While online traffic analysis has been widely studied, it is still intensively challenging due to several reasons. One of the primary challenges is the heavy volume of traffic to analyze within a finite amount of time due to the increasing network bandwidth. Another important challenge for effective traffic analysis is to support multivariate functions of traffic variables to help administrators identify unexpected network events intuitively. To this end, we propose a new approach with the multivariate analysis that offers a high-level summary of the online network traffic. With this approach, the current state of the network will display patterns compiled from a set of traffic variables, and the detection problems in network monitoring (e.g., change detection and anomaly detection) can be reduced to a pattern identification and classification problem. In this paper, we introduce our preliminary work with clustered patterns for online, multivariate network traffic analysis with the challenges and limitations we observed. We then present a grid-based model that is designed to overcome the limitations of the clustered pattern-based technique. We will discuss the potential of the new model with respect to the technical challenges including streaming-based computation and robustness to outliers. The online version of this article ( https://doi.org/10.1007/s11390-019-1915-y) contains supplementary material, which is available to authorized users. The authors would like to thank Brian Tierney at ESnet for the helpful discussion and support with the network traffic trace data. Choi J, Hu K J, Sim A. Relational dynamic Bayesian networks with locally exchangeable measures. Technical Report LBNL-6341E, Lawrence Berkeley National Laboratory, 2013. https://www.osti.gov/servlets/purl/1165582, November 2018. Mills-Tettey A, Stentz A, Dias S B. The dynamic Hungarian algorithm for the assignment problem with changing costs. Technical Report, Carnegie Mellon University, 2007. https://www.ri.cmu.edu/pub_files/pub4/mills_tettey_g_ayorkor_2007_3/mills_tettey_g_ayorkor_2007_3.pdf, November 2018. Schikuta E. Grid-clustering: A fast hierarchical clustering method for very large data sets. 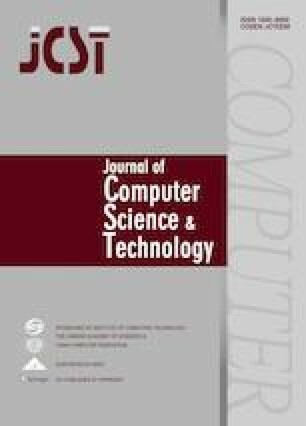 Technical Report, Rice University, 1993. https://www.researchgate.net/publication/210242098_Grid-Clustering_An_efficient_hierarchical_Clustering_method_for_very_large_data_sets, November 2018. 1.Department of Computer ScienceTexas A&M UniversityCommerceU.S.A. 2.Computational Research DivisionLawrence Berkeley National LaboratoryBerkeleyU.S.A.